is professor emeritus of biology at Hampshire College in Amherst, Massachusetts. He lectures around the world and organises research on animal behaviour, especially the behaviour of canines. His latest book is How Dogs Work (2015), co-authored with Mark Feinstein. is a professor of linguistics at Hampshire College in Massachusetts. His current work focuses on the vocal behaviour of domesticated animals and his most recent book is How Dogs Work (2015), co-authored with Raymond Coppinger. A Jack Russell terrier tears in and out of its doggie door, skidding and sliding on a hardwood floor, only to repeat the performance over and over again. A Border collie in the park leaps to catch a ball, runs and drops it back at the owner’s feet with a look of anxious anticipation. There’s no food treat in store for these animals, no pats on the head – they seem to do it out of sheer playful exuberance. But what are they really up to? 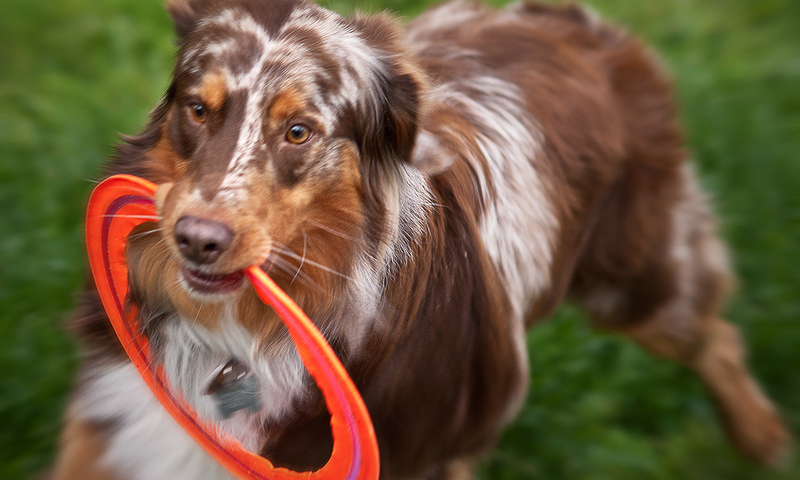 What does it mean for a dog to ‘play’? Konrad Lorenz, Nikolaas Tinbergen and Karl von Frisch, founders of the field of ethology (the study of animal behaviour) shared a 1973 Nobel Prize for their demonstration that, just like physical shape and structure, the patterned movements of animals in time and space are evolutionary adaptations. These ‘motor patterns’ are products of natural selection that enable animals to meet the fundamental challenges of life: to acquire energy by feeding, to avoid hazards to life and health, and to successfully reproduce. However, when we look at puppies enthusiastically chasing and nipping at each other, or chewing on a favourite rubber toy and tossing it in the air, it’s hard to find any biologically adaptive value in the activity. If anything, it often looks just like fun to us, a joyful waste of time and energy. Could the goal simply be pleasure for its own sake? The problem is that this doesn’t fit into the classical model of Darwinian natural selection, which we assume is the main force that drives adaptive change. Dogs chasing each other in the park probably aren’t going to get more food than their less lively peers; chewing a rubber ball yields no calories at all. Indeed, playing is energetically wasteful. It doesn’t help young animals to avoid dangers such as predation, and it doesn’t produce more offspring. So what’s the (biological) reason for play? Hypotheses abound. Could it be, for example, that play behaviour is a way for young animals to practise skills they’ll need in adulthood? It does seem to contain parts of adult behaviour – ‘playing’ animals often chase and capture things as if they were engaged in mock hunting, for example. Perhaps play helps young animals learn how to deal with aggression more effectively, or to interact more successfully with potential sexual partners. There isn’t any immediate fitness benefit, no calories to be gained, but maybe the adaptive pay-off is that you’ll eventually be a more effective adult, ultimately with a greater chance of reproductive success. In our recent book How Dogs Work, we come to a different conclusion: ‘play’ is not, at its heart, an adaptive form of behaviour at all. Instead, it simply emerges as an artefact of the way that animals develop over the course of their lifetimes. Mammals, for instance, must make a profound and far-reaching change from being a dependent newborn, through a juvenile stage, into an independent adult in its own right. The adult has a new form and a new behavioural repertoire: it has changed from a nursing, care-soliciting neonate into a foraging, courting adult with the ability to escape from predators without help. As a newborn grows over time, its behaviour, like its physical form, needs to be ‘re-modelled’. In effect, it has to undergo a physical and behavioural metamorphosis into an adult. Not unlike the transformation of a caterpillar into a butterfly, the structures of the newborn mammal are partly disassembled and then ultimately reconstructed into the adult. This transitional metamorphic form is often called a juvenile. As development unfolds, the animal’s whole physical system, along with its behavioural repertoire, must constantly be re-integrated so that the organism can continue to work as a functioning whole. Juvenile mammals – the archetypal playing animal – are organisms in the midst of this radical transformation. As they grow, they tend to randomly combine bits and pieces of waning newborn behaviour and emerging adult behaviour. These combinations are often repetitive, and sometimes quite novel, but rarely adaptive in the standard Darwinian sense. They are the accidental product of interacting behavioural systems that are re-modelling as the animal develops over time. Dogs have longer periods of juvenile development than rats or cats; mammals in general have a much longer and more varied ‘metamorphosis’ than birds or reptiles. So dogs appear to play more than many other animals, not because there is an advantage in dogs playing more frequently, or because they enjoy it more, or because they want to please us more, but simply because they grow at different rates and in different ways. Development has another effect on apparently playful activity. Many motor patterns require a ‘releaser’, something in the world that triggers the animal to behave in a characteristic way. In many cases, the response to these stimuli is instinctive, built-in and automatic. But sometimes an animal needs a little experience in the course of development to get it just right. A colleague of ours once watched a big wolf pup on a frozen lake doing a ‘fore-foot stab’, a classic carnivore motor pattern where the animal jumps at prey with an outstretched front paw. But the object of this pup’s attention wasn’t a mouse or vole: it was pouncing over and over again on little bubbles under the ice. Normally, detecting a small running rodent should trigger the movement since it’s an adaptive, evolutionary and ancient behavioural response that leads to food. As we observe a wolf pup jumping at bubbles, or a dog leaping to catch a Frisbee, it looks for all the world as if these are simply animals happily at play. But they are instead simply expressing a developing motor pattern that is directed to an inappropriate stimulus. Think of dogs chasing cars instead of sheep, or kittens eyeing and stalking a ball of string. Lots of so-called play, we think, might simply be the playing-out of developmentally incomplete, cobbled-together behaviours that are sometimes mistakenly triggered by inappropriate or misidentified stimuli. Perhaps these behavioural mistakes feel pleasurable to animals. Maybe they ultimately will contribute to adult fitness. But, in our view, playlike behaviour doesn’t need to be explained by an evolutionary history of adaptation, and it doesn’t have a special biological purpose. ‘Play’ is simply a byproduct of the way that young animals grow and develop.